I have always loved the fabrics designed by Kate Spain. Thing is, I don't buy fabric by designer. I pretty much never buy pre-cuts or anything by collection. So I just look longingly at quilts made in her fabrics. 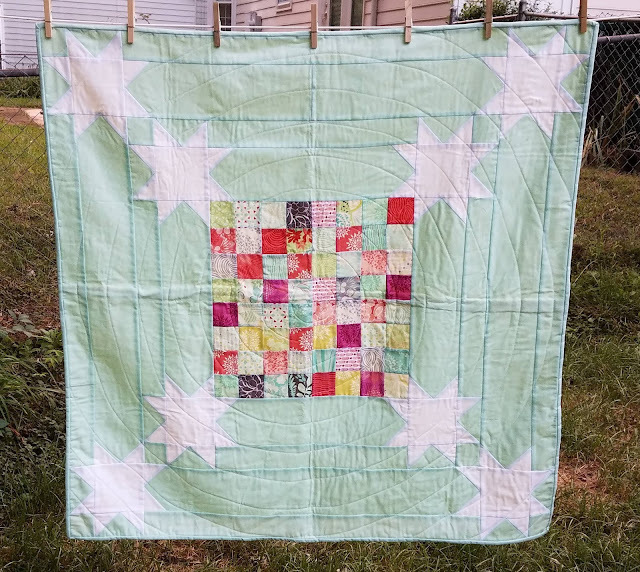 I still remember when her line Kudzu came out, I picked it up at quilt shows and shops 6 or 8 times, realized each time it was the same line I kept picking up, and never bought it. Then I was shopping what I think was a Black Friday sale at Missouri Star and on a whim, I bought 2 mini charm packs of Canyon. I didn't have a plan but I wanted to finally play with Kate Spain goodness. Then I saw the perfect pattern in the book Charm School by Vanessa Goertzen. This is Scrap Happy. Her pattern just includes the first star; I thought it wasn't quite big enough so I did the math to add a second star. The background is Kona Ice Frappe and the stars are Kona White. 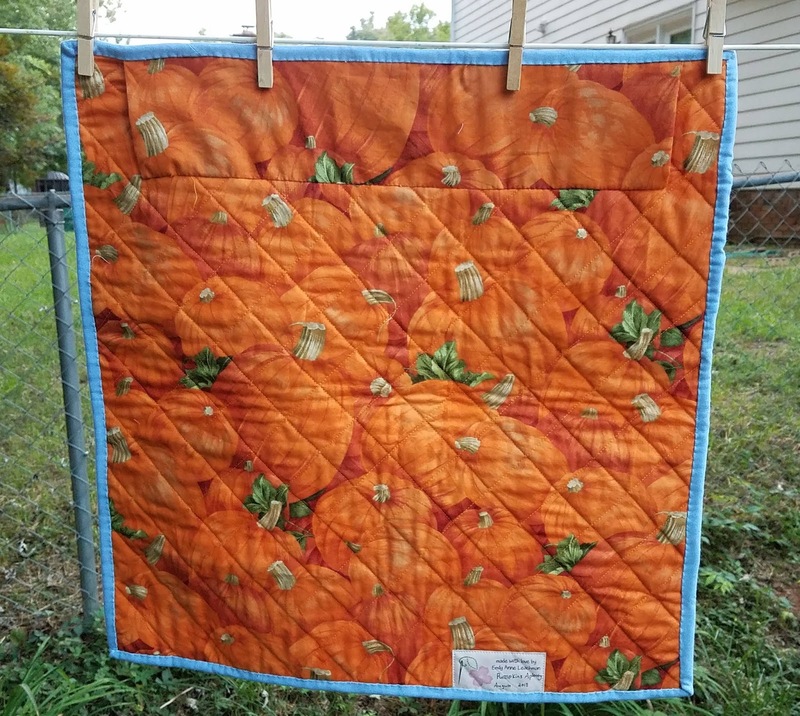 I did one of my favorite easy quilting methods: large spiral. I love how it turned out so much! This pattern is great for mini charm packs or 2 1/2" scraps. I am sure I will use the pattern again. This will be donated to Project Linus. 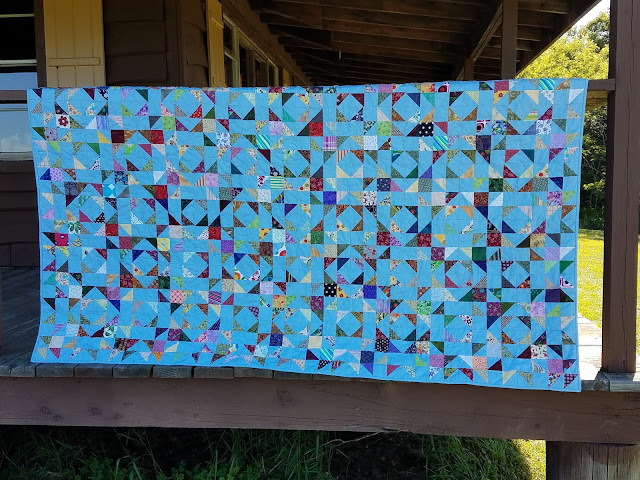 My goal is 12 quilts a year and this is number 12 for 2018! There will likely be a few more before the end of the year. Laura at Slice of Pi Quilts does a charity link-up at the end of each moth and I'll be linking up. So glad to have met my goal for the year, and early! Canyon was #14 on my list of Q3 goals for the Finish Along. 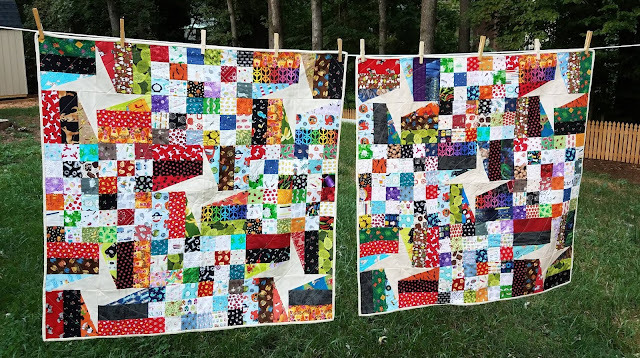 It is also on my list of projects needed for my PhD (Projects Half Done) with Quilting Gail. 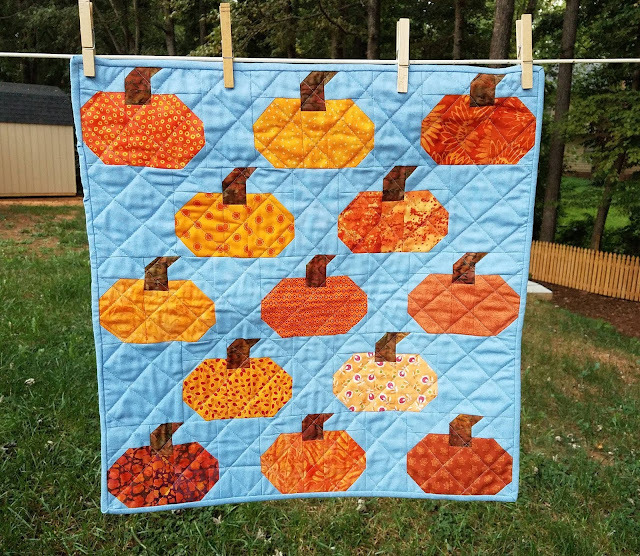 I've been doing the Fall Quilt Along from Partners in Design. They did the Christmas quilt along that I followed along with last year. It's a fun way to do lots of different blocks with different techniques. One of the blocks this year is a super cute pumpkin block designed by Bobbi of Snowy Days Quilting. As soon as I saw it, I knew I wanted to make a small quilt to decorate the door for fall. Aren't the small pumpkins the cutest? The original design had a more tapered stem and I did it that way for my FAL block. But I really didn't feel like I got a lot more bang for the fiddly pieces buck, so I took out that part for the wall hanging. 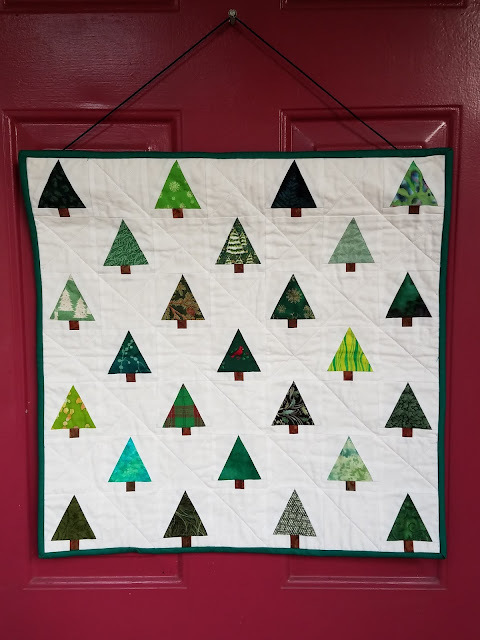 Last year, I did the same thing with the Christmas Tree Farm block by April of JANDA Bend Quilts. 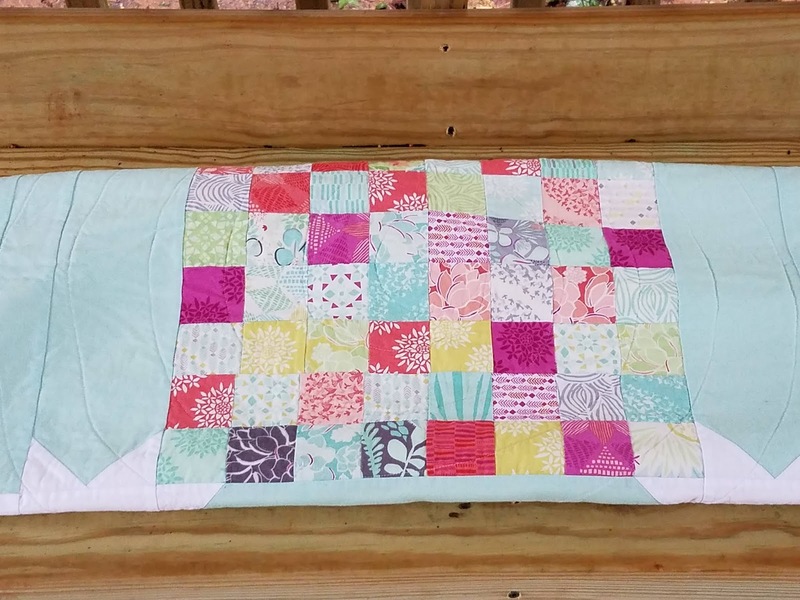 Every January, Carole at From My Carolina Home starts a scrappy mystery quilt along. I did the original Scrap Dance and Scrap Dance Tango and was excited to start Scrap Dance Square Dance this year. I decided to use my novelty/I Spy scraps for this year's mystery. Once it was revealed that there were spinning stars, I altered the layout a little bit so there were only completed stars. 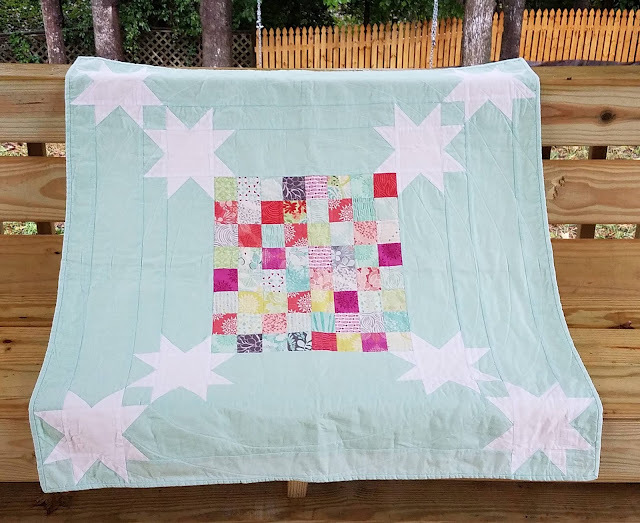 It just so happened that it worked out that I could make two smaller quilts from the pieces I had already assembled, so that's what I did! They are a bit busy, aren't they? The solid is Kona Sand and I wish I picked something that showed up more. But I really like them. So much fun stuff to see. Both of these will be going to Project Linus. And here's a close-up of one of the stars. 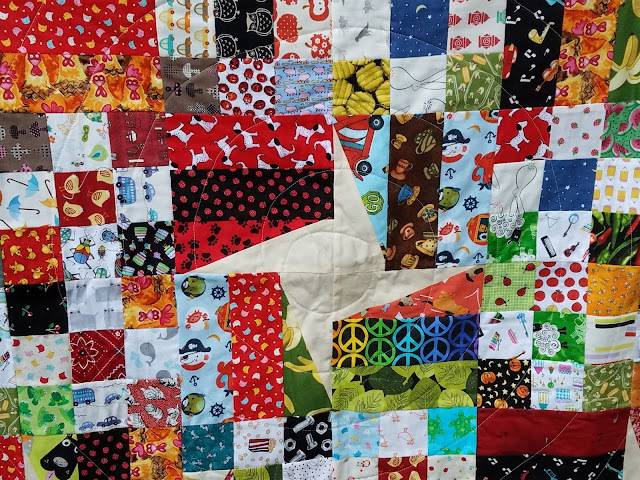 This is the star in the middle of the quilt, so you can see that I used spiral quilting around the entire quilt and started in the center. I really enjoy Carole's mysteries and love that she designs them with scraps in mind. I linked to the other Scrap Dance mysteries I completed, but figured that maybe you want to see them without clicking the links. 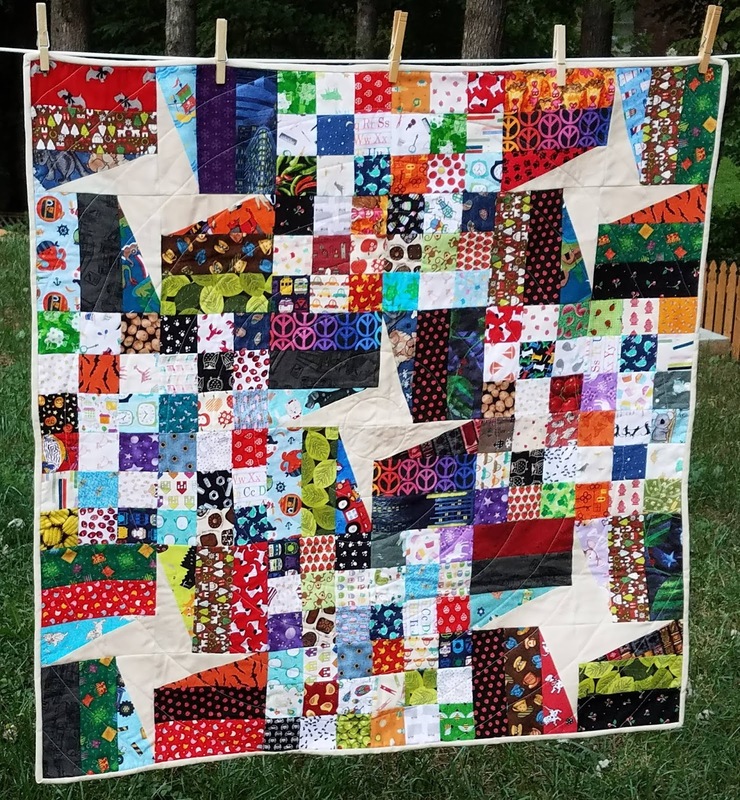 Scrap Dance Square Dance was #18 on my list of Q3 goals for the Finish Along. 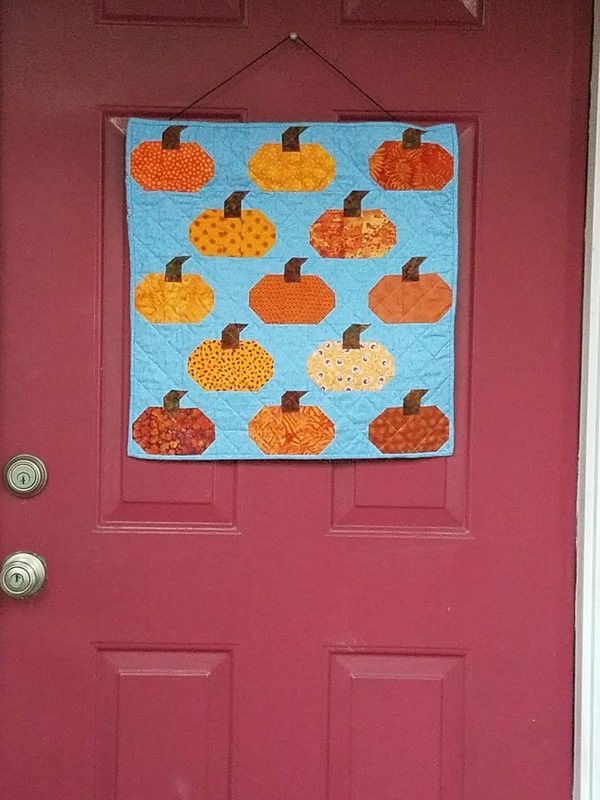 I've been making a series of seasonal and/or holiday small quilts to hang on our front door. I've been wanting one for birthdays and with 2 family birthdays in October, now seems like a good time. 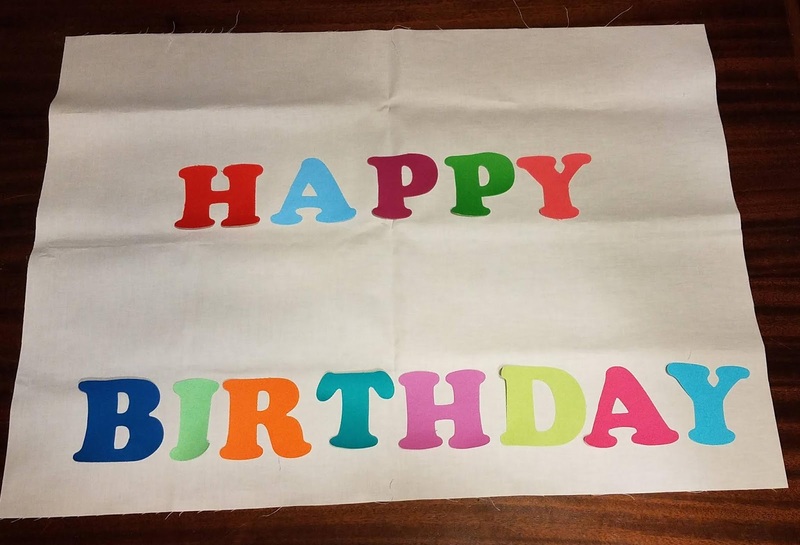 I've got brightly-colored letters cut out and I will be adding a (fabric) cake. 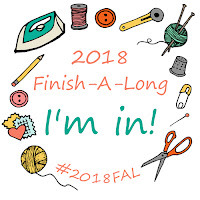 My son's birthday is mid-October and I'd like to have this to hang on the door for his party to mark the house, so it seems like a great project for my One Monthly Goal link-up with Patty at Elm Street Quilts. My goal is to have it completed and ready to hang by the end of the month. 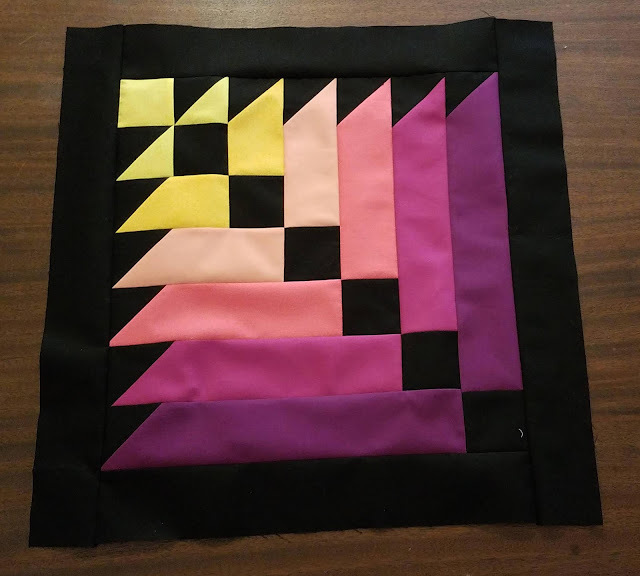 I've stayed caught up in both of my online quilting bees, though I'm behind in posting pictures of my blocks. 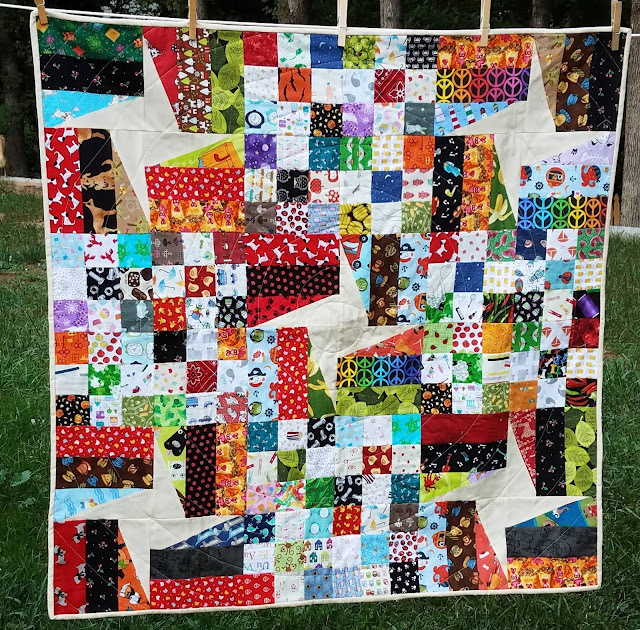 Bees are great for giving me a variety of blocks to play with in a variety of styles, color combinations, and techniques. Bee Inspired for July was Queen Sue. Sue asked for a toadstool block. She asked for the same block in Stash Bee earlier this year and I crashed her hive because I liked the block so much. I was thrilled to make two more toadstools. This is for Sue's niece, Tilly, who is almost 3, so novelty prints were encouraged. Stash Bee's July Queen was Queen Heather. 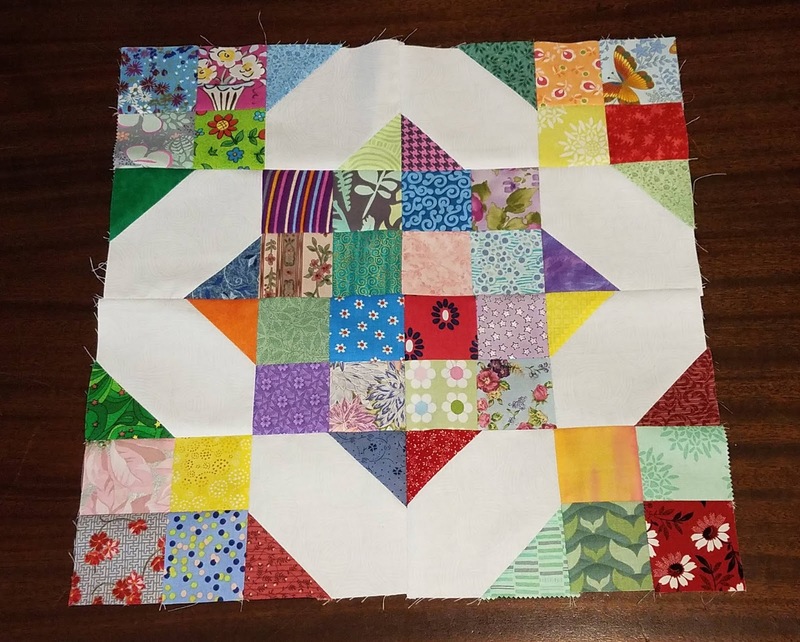 She asked for a Scrappy Crossroads block designed by Lori Holt. 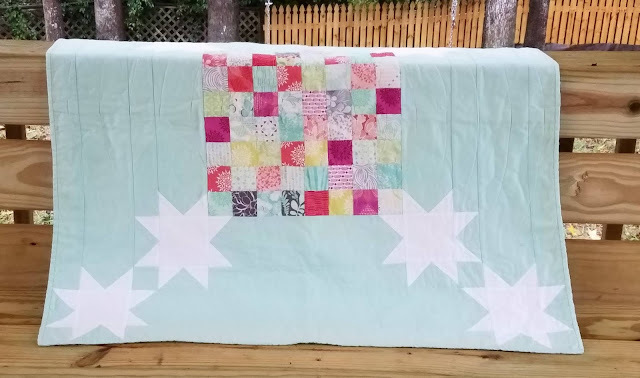 I was able to use 2 1/2" squares already cut and in my scrap stash. 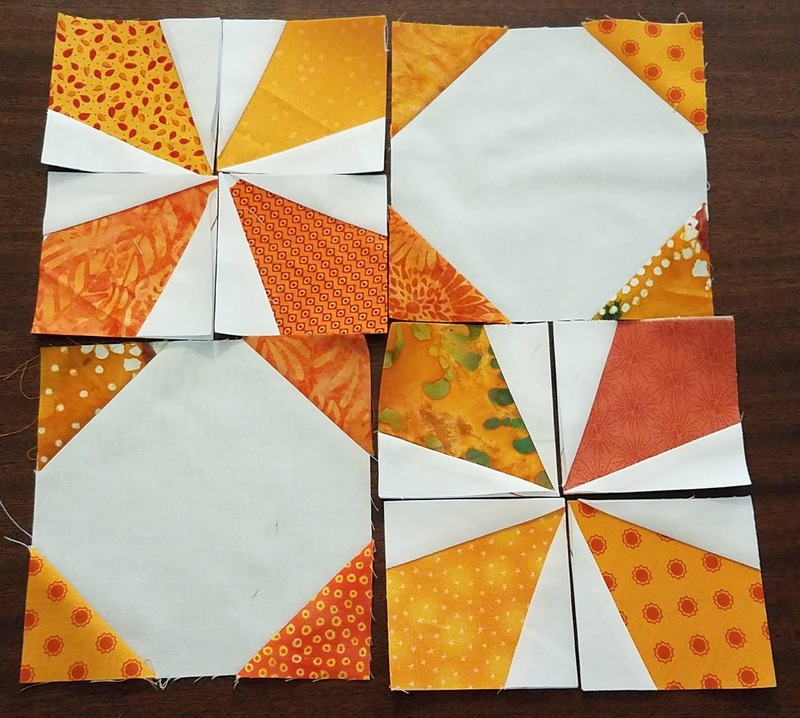 I actually made my August blocks fairly early in the month but I didn't feel as though I could post them until they were actually in the mail. I finally got them packaged up and have received confirmation that all have arrived to their intended Queens. Queen Karen of Bee Inspired asked for Wanta Fanta blocks in shades of orange. 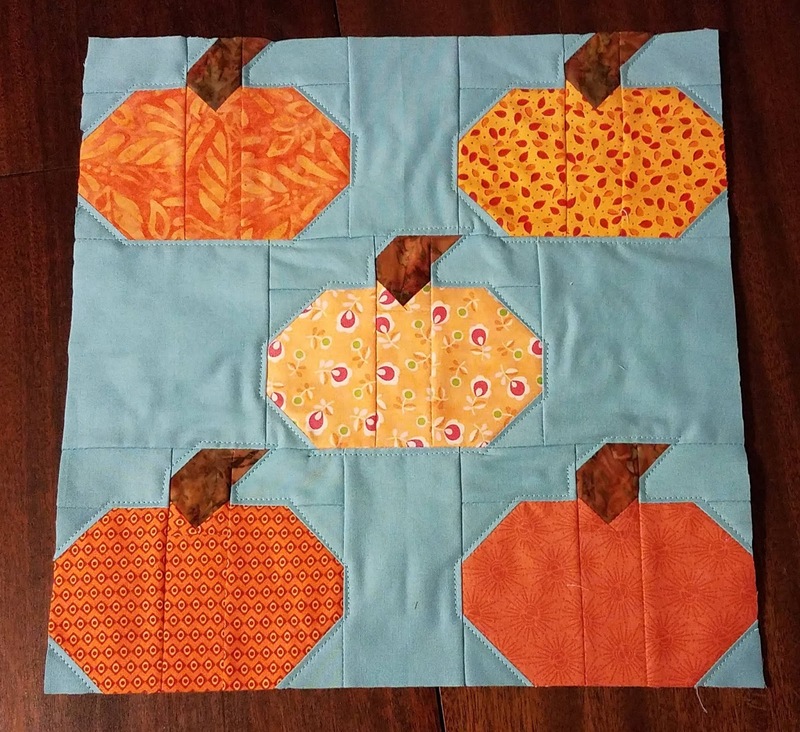 I had seen the Wanta Fanta block in Stash Bee many times but this was my first time making one. Karen asked that we not assemble the block components so that she can mix and match, so that's why my block isn't fully assembled. I tried to repeat as few fabrics as possible, though orange is not my favorite color so my stash lacks a lot of depth in the orange bin. 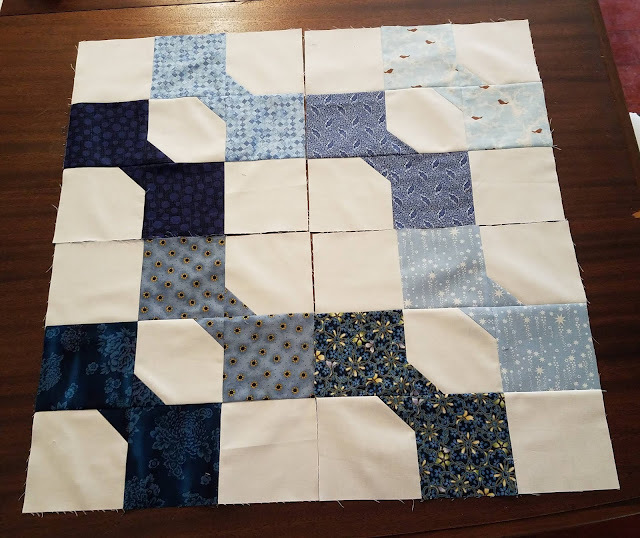 Queen Mary Ann of Stash Bee asked for double bow tie blocks in shades of blue. Mary Ann is making a quilt for each bed in the Friendship House in Fayetteville, NC. I was in her Stash Bee hive last year as well and made blocks for a Friendship House quilt and I was so impressed with her goal and the program that I sent her a completed top that she quilted and donated. I knew I wanted to make extras blocks for this great cause. One of our members is undergoing extensive medical treatments, so I made two blocks from me and two from that member. The September Queens made their requests yesterday so now I need to get busy! I really do love the variety of blocks in my bees and getting to talk with quilters from all over.